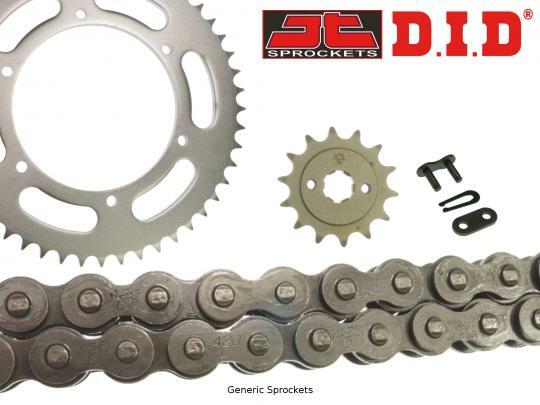 The picture below shows a DID Standard Chain and JT Sprocket Kit. Thousands of other top quality spares listed on our website at refreshingly low prices. Although DID S Standard chain represents DID's simplest grade of chain, it still features the finely-tuned engineering and high-quality control that DID is so well known for, using the latest in Japanese chain technology. The bushing on a chain is important for impact and wear resistance, and helps to absorb the shock from the rollers rather than directly transmitting it to the pins. By using rigid, seamless, solid bushes, instead of curled bushes that other manufacturers use, the wear-life of a DID Standard chain can be 1.2 to 4 times the life of a chain using curled bushings. All DID chains are made in Japan. If the original equipment chain was an O-Ring or X-Ring chain, it must not be replaced with a standard chain. It must be replaced with a sealed chain of equal or greater strength. JT is the best selling aftermarket sprocket in the world. Using the finest raw materials and cutting-edge technology in production, CNC computer design and precision machining, JT ensure maximum durability and performance.